Maverick finds Charlie's toys and even helps their owners walk the older dog. Charlie and Maverick are the best of doggone friends . Charlie, an 11-year-old Golden Retriever, and 4-month-old Maverick play, take joy rides and even nap together. But, Maverick plays a rather large role in his pal’s life. Maverick is Charlie’s seeing-eye dog . 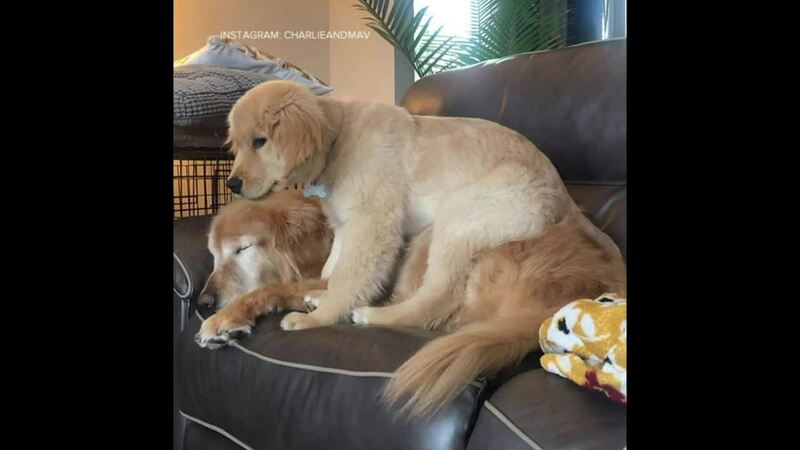 According to their owners, Chelsea and Adam Stipe of Mooresville, North Carolina, who just welcomed their first child, Asher, Charlie was diagnosed with glaucoma and had his eyes removed a little while back. So, on New Year's Day, Chelsea and Adam Stipe brought Maverick home. As the months went by, Maverick began helping Charlie get around. He brought the Golden Retriever his lost toys back to him. The pup even uses a leash to help guide him. And, helps his owners pull Charlie along as they go for walks. Chelsea and Adam Stipe told ABC News Friday that both dogs are doing great. They eat, sleep, play, repeat. And, Charlie has even been acting years younger, thanks to his puppy pal.